As someone who lacks self control around her spice cabinet, restraining this Chicken Feta Pasta to five simple ingredients felt radically unsound. 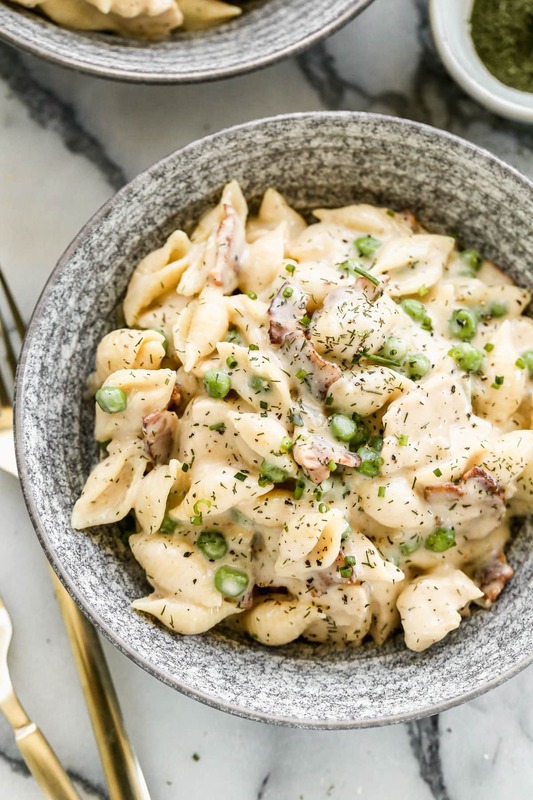 Surely, an easy chicken pasta recipe that’s made in ONE pan with only FIVE things I already had in my pantry couldn’t possibly have great flavor, pleasing texture, and be a dish that my husband would request on repeat? I should restrain myself to five ingredients more often. 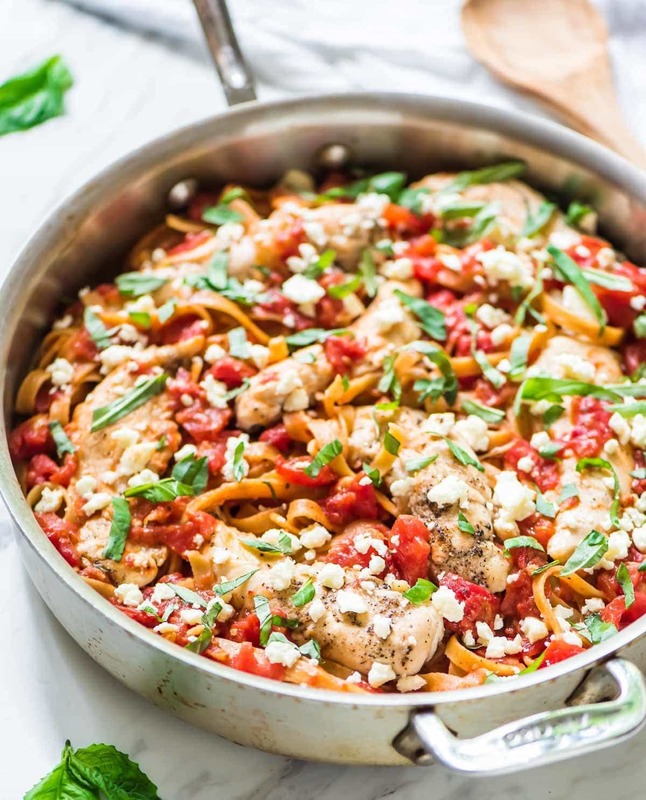 Not only did this Chicken Feta Pasta taste outstanding, it was ready in 30 minutes and made fantastic leftovers too! The wizard behind this five-ingredient magic is friend and fellow blogger Phi. 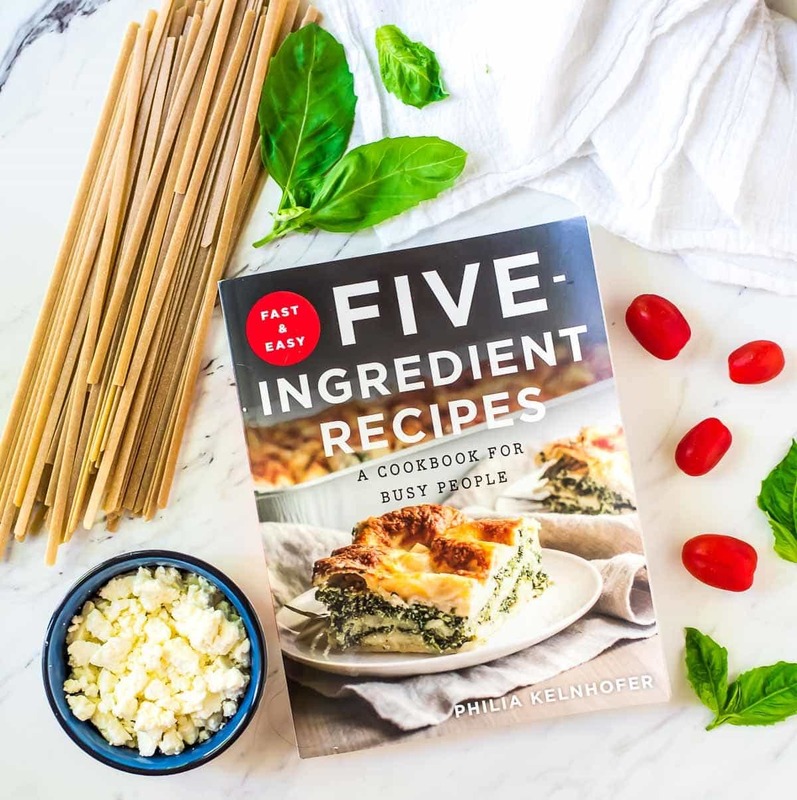 Her cookbook Five Ingredient Recipes: A Cookbook for Busy People is officially on shelves, and I could not be more proud of her. Phi lives in Milwaukee and was one of the first people to welcome me to the city nearly two years ago. Since before I met her, Phi had a dream to write a cookbook, and it’s been incredibly inspiring to watch her make those dreams come true. A few weeks ago, she hosted a book launch party in downtown Milwaukee, and it was PACKED. On the menu: nine different recipes from her book, and, folks, let me tell you: we all need to restrain ourselves to five ingredients more often. Every single one was outstanding! 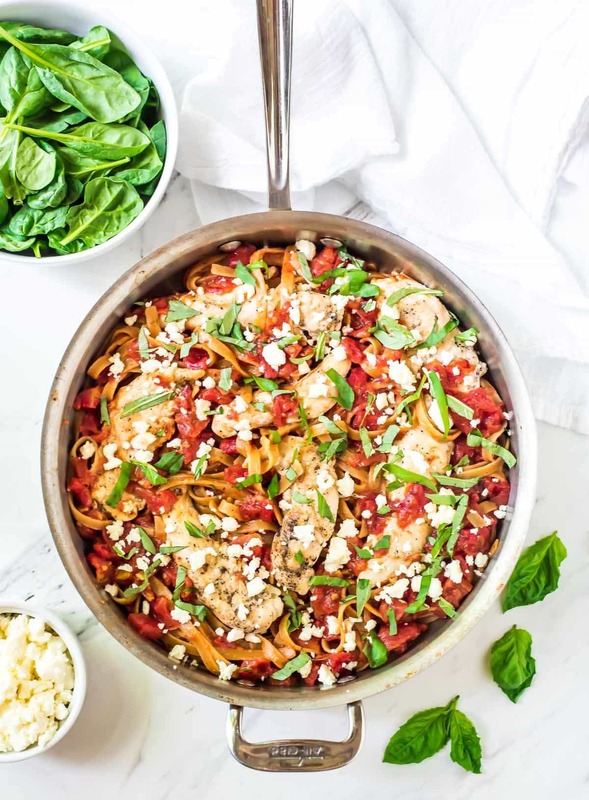 When I was paging through the book to find a recipe to share with you here, what caught my eye about this Chicken Feta Pasta (aside from the fact that it looked delicious), was the little blurb Phi included above the recipe. This dish is the first meal she cooked for her husband Nick, and is still one of his all-time favorites. If Phi’s taste-tester #1 approved, I knew we would too. The only changes to the recipe I made were to use whole wheat pasta noodles, and sprinkle a little fresh basil I had sitting on my counter over the top. This dish is creamy, healthy, and ready-to-go in a snap. What more could I wish for? Phi is also offering one lucky reader a chance to win a PERSONALIZED, AUTOGRAPHED copy of her cookbook. That’s right—the author/celeb will be dedicating and signing the winning copy! 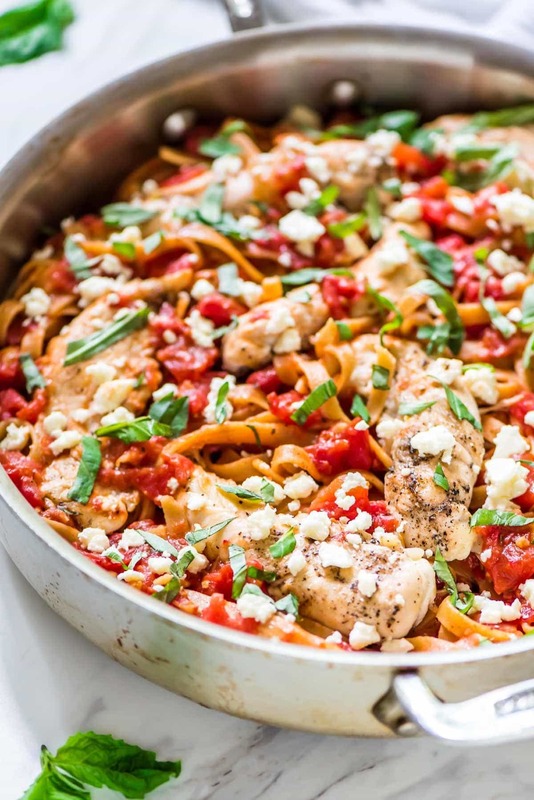 One-Pan Feta Chicken Pasta. Only 5 ingredients! 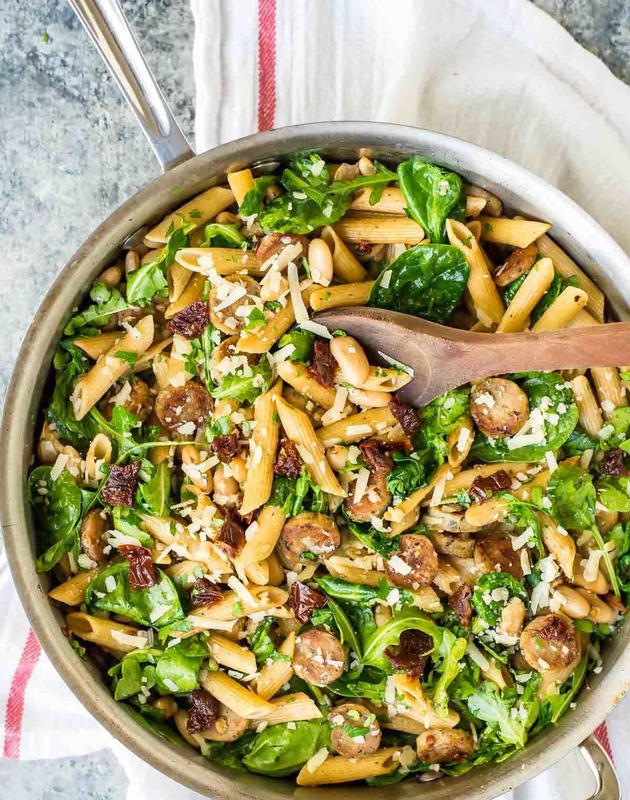 Everything cooks in one pan, including the pasta. 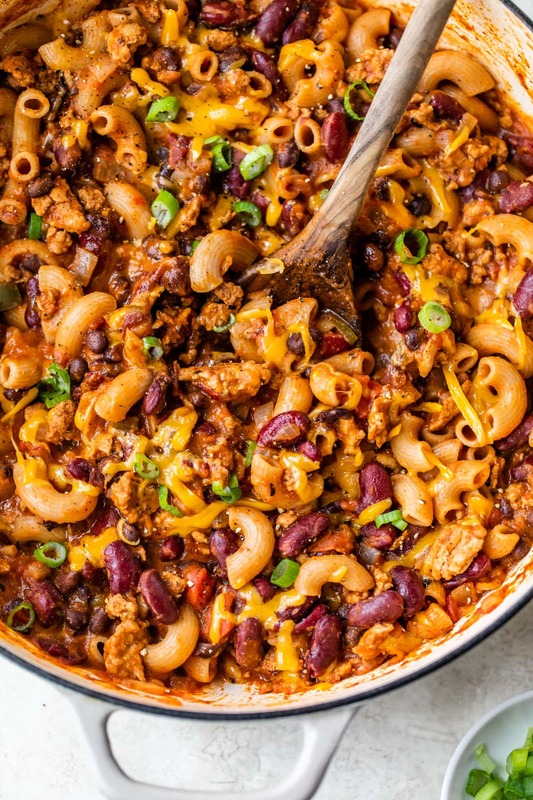 EASY, delicious recipe and a crowd-pleaser. In a large pot or Dutch oven with a lid, heat the olive oil over high for 1 minute, then add the chicken breast halves. Sprinkle with 1/2 teaspoon salt and the black pepper. Cook the chicken on one side for 8 minutes, moving it around in the pan a little to prevent sticking, but not too much, so that a nice crust will form. Lower the heat as needed if the chicken seems to be cooking too quickly. Flip, sprinkle with the remaining 1/2 teaspoon salt, then cook for 5 additional minutes, until the chicken is cooked through. Add the diced tomatoes and water. Stir in the pasta and cook, uncovered, for 5 minutes. Cover and let cook an additional 10 minutes. Remove the lid, stir, then add three-quarters of the feta. Stir once more, then let cook uncovered for 5 additional minutes. Serve warm, sprinkled with the remaining feta cheese and fresh basil. Store leftovers in an airtight container in the refrigerator for up to 4 days. Reheat gently in the microwave with a light splash of water, chicken stock, or tomato pasta sauce to keep from drying out. 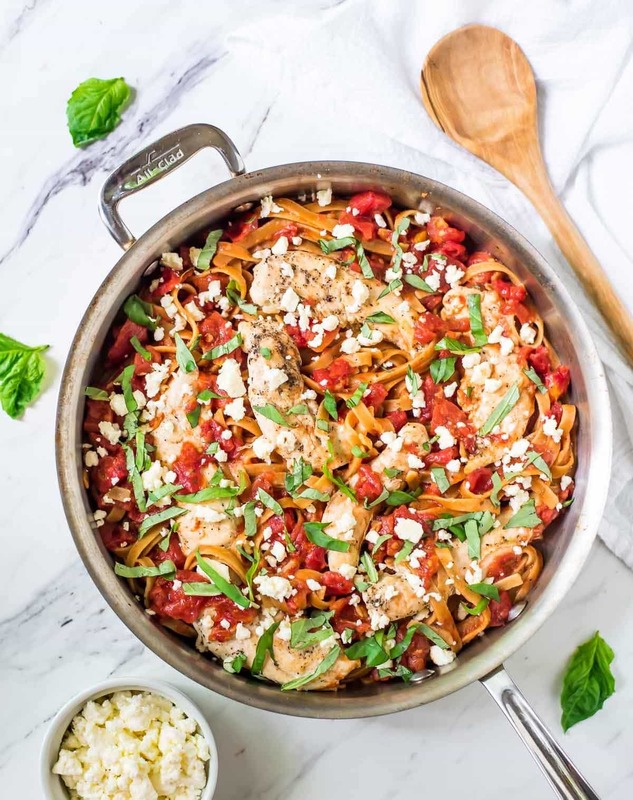 If you like this 5 Ingredient Feta Chicken Pasta, you’ll love these other quick and easy pasta recipes! Thanks Phi for offering the giveaway prize to the lucky winner! Giveaway to remain open until 10 p.m. CST on Sunday, August 8th. Open to US residents ages 18 and older. One (1) winner will be selected.